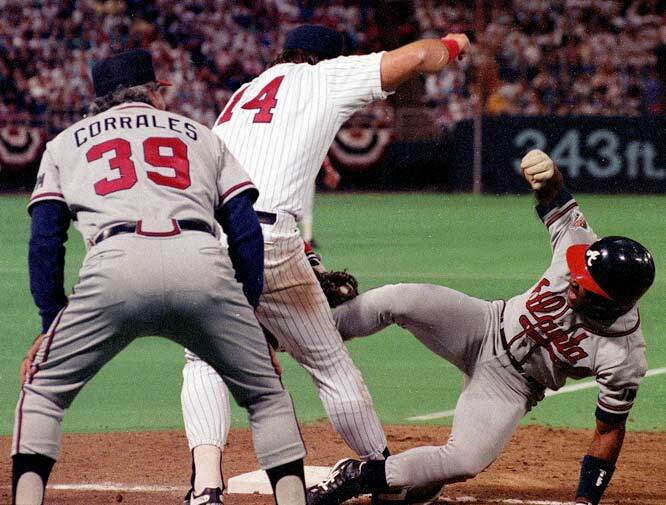 This entry was posted in Fun and tagged Atlanta Braves, blogging, Dallas Cowboys, Drew Pearson, Kent Hrbek, Minnesota Twins, Minnesota Vikings, Ron Gant. Bookmark the permalink. That World Series was memorable for me. I have been a Twins fan all my life, and in September 1991 I headed to Germany to spend a year there working on my dissertation. For the first three months I sublet an apartment in Berlin, and found out that the series was on Armed Forces Radio, which one could get in Berlin. So every night about 1:00 AM or so (for night games — early evening for day games) I made some popcorn, popped open a Schultheiss beer and listend to Johnny Bench and Vin Scully make the series come alive. Not having TV I couldn’t see the plays, but the skill Scully brought to painting a scene made me feel I was there. After Jack Morris’ performance in Game 7 I went to bed at 6:00 AM on a baseball high. Later back in the US I started watching videos of the series, but it seemed vapid. The announcers were boring and it just wasn’t as compelling as the radio. Perhaps it was because I already knew the result, but I also think that baseball is a game especially suited for radio. That World Series was memorable for me. I was in the dome for games 6 and 7 of the ’87 Series. 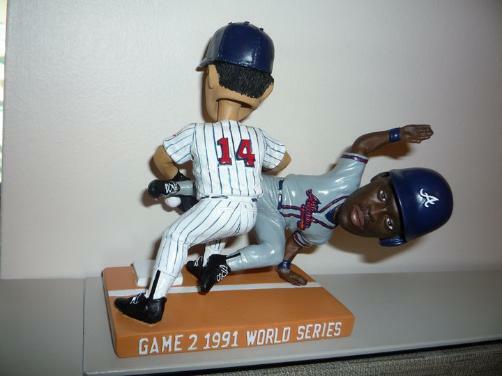 I wept after the ’91. Does a “beer high” count? Oh yeah, Nate Wright was pushed! That was the best Viking team of that era and they wuz robbed. Oh well, I guess one has to balance the pleasant sports memories with the unpleasant. Oh yeah, Nate Wright was pushed! To this day I get the shakes when I hear Drew Pearson. I was living in Minneapolis in ’87 (at that time actually in Shoreview, a suburb) but watched the games with friends. I remember sitting at home with my radio keeping score of the games back when Rod Carew, Tony Oliva, Harmon Killebrew, Steve Braun, Larry Hisle, etc. were playing, every year wanting them to win it. One year I tried taping home runs on a cassette player and I got Larry Calton calling Tom Kelly’s only major league home run back in ’75. So 1987 was sweet. I’d gone to opening day that year, and enjoyed a number of games — it was so cheap! When Hockey moves from Minnesota to Texas, you know there is something wrong with the world. But Gopher hockey is what really mattered. When Hockey moves from Minnesota to Texas, you know there is something wrong with the world. It broke my heart. I’ve never gone back. Gopher hockey is what really mattered. Though he won only early in his career, I love love LOVED that Woog only recruited players from Minnesota. I went to many UofM hockey games…..